After a difficult election for all (regardless of who you supported), here is what I know to be true today. There are people who love us and who we love. It is our responsibility to be the ultimate example for our children and we will. We are who make this country great and it is our duty to continue to be kind and generous and gentle with our neighbors and friends. Give someone a smile or a hug or a kind gesture today. What you put out there will come back to you. My father’s mother, one of my beloved grandmothers who I call Nana Ruth, is a woman I have always had great respect for. She marched with Dr. Martin Luther King Jr., she was involved politically and believed in fighting for progression in a time where it wasn’t as attractive or expected as it might be now. She was also the most gentle person that I have ever known. I had the privilege of being with her and my family at the time that she passed away and it was a beautiful and heart-wrenching experience that was burned into my soul. It changed me. It opened my eyes to so very much that I couldn’t see before. And it helped me understand how much good each one of us can do in the time that we’re given. My grandmother used to say that it costs you nothing to show kindness or love to someone else. This is something that I value above most other things and I try to make it a daily practice. It helps that I tend to have the ridiculous ability to speak to just about anyone, but usually for only a few seconds. I am not someone who will have a full conversation about life, love and rock and roll with a stranger, but I am someone who will smilingly compliment them on a shirt or shoes and then go on with my day. My kids tease me for telling the drive-thru window cashier at McDonald’s that I love her nails or the bagger at the grocery store that I dig his haircut. I have even gone as far as saying, “I am married and I swear I’m not hitting on you, but you smell amazing!” to men and women alike in a restaurant or in passing. And if it’s the truth, why not say it?? It would be unfair for me to say that these are altruistic acts because I do get something back from them. I get a smile. I get to know that someone said something nice to that person today – and meant it. At this point in my life, it is something that I don’t even think about until after I’ve said it, but it is very very important to me. And it costs me nothing. You don’t know what other people are dealing with on a day-to-day basis. It is so easy and absolutely human for us to get caught up in our day-to-day struggles and stresses that time just goes by. But this you can do. You don’t have to find a way to travel to a third-world country or run for a political office to be one of the many who helps in this world. It can be the little things. It is the smiles and the kind gestures that make our country and our world a better place. What can you do – as small or large as you see fit – to make this world a little brighter today? 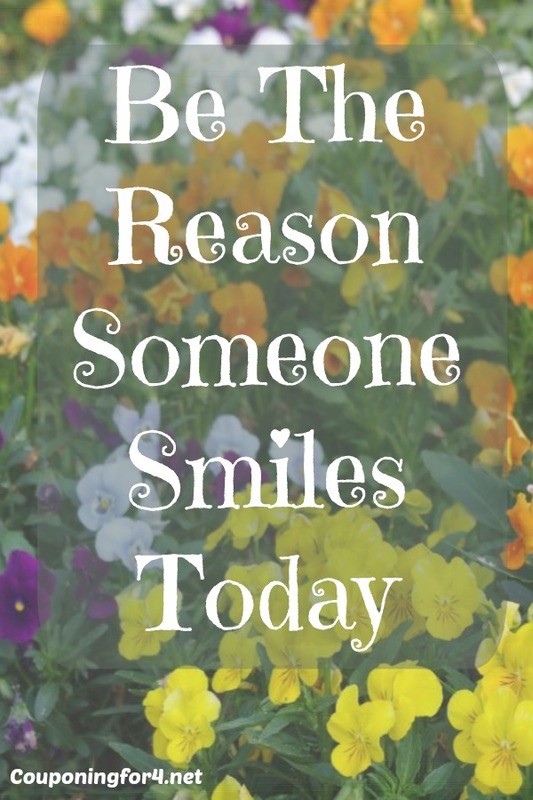 Charge yourself with being the reason someone else smiles today and you will find that it has made your day as well. Need a little more empowerment? Check out the full series here.